We missed Chinese sculptor Xu Hongfei’s exhibition in Sydney, so were delighted to catch it in Federation Square during our visit to Melbourne! The bright midday sun made iPhone photography tricky, but there was so much joy and exuberance in the pieces that I wanted to try and capture a little of it to share with you. 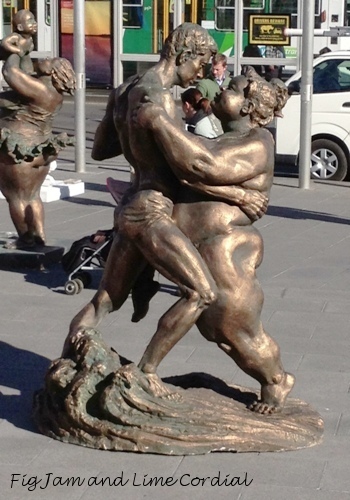 Through his translator, the artist is quoted as saying that the message he wanted to convey was simply that chubby women “can be very happy and very beautiful and very confident”. Bravo! I wonder if he’ll do an accompanying series for chubby men? And this one is my favourite, possibly because Big Boy plays the French horn, but also for the sheer happy concentration on the statue’s face. Just fabulous! Aren’t they lovely! So cheerful and exuberant. Love! Those are just awesome – I love the facial expressions especially. Thank you for sharing your visit and the statues with us! Wonderful! A celebration of chubbiness in all its beauty! Great photos too, Celia. I think this is so fun and filled with joy! I love it that this is a man’s perspective- but I’m not surprised- women are much more judgmental of body size. I love the sculptor- he looks a lot like the man in the pieces. And I love that you shared this with us, Celia! You are a delightful woman and filled with a wonderful sense of joy! Thanks so much! Lorraine, they were so much fun – and drew such a big crowd too! it’s a bit crazy that i have to read your blog to find out what’s been on in my home town! Love Love Love this post, as much as I love your food posts it is posts like this that make your blog so rich and enjoyable. Thank you. What a wonderful HAPPY expression of life! One with a great deal of wisdom behind the artistry methinks, Celia :) ! I just love ‘The Kiss’ and the first one I think unnamed . . . simply joyous!!! So many things on in Melbourne at the moment that I’d love to see – this included. Thanks for the bright, cheery pics, Celia. Christine, so glad you enjoyed them! The exhibition was only on for a week in July.. These are wonderful. They made me smile. Thanks! Maz. These sculptures look beautiful and so vibrant & happy Celia! Aren’t they great, Jane? The boys wanted to do other things, or I’d have lingered longer and taken more pics! Hi! I’ve nominated you for the best moment award. It’s completely optional, so if you’re interested then check out this post. Thank you! I don’t do blog awards, but it’s very kind of you to think of me. I do love the chubby lady with the French horn – it’s so joyous! What fun! Love how the photographer captured them in such a way to show off the sites around Sydney’s harbor. Exhibits in urban settings are really fantastic and I bet this one is very popular. John, I’d seen photos of them in Sydney, but we missed them here. It was so nice and fortuitous to catch them in Melbourne! Waw! I love it all too! :) Georgous statues: funny & pretty too! I love humour in statues! So true! We need real humour in our lives! Great photography & to think that was with your IPhone. What amazing pieces. Just seen some of these in the Piazza Grande in Montepulciano otherwise I might never have seen them. ‘Joyous’is a great word that has been used to describe them. I loved them particularly ‘Kiss’ and the sculpture of the lady playing tennis. They’re pretty wonderful, aren’t they? :) How great that they’re traveling the world!